I had a 'worlds collide' moment last night while watching Walking Dead. Lodged somewhere in the middle of the show's one-too-many commercial breaks I saw brothers Chris and Steve, of next-gen New York house duo the Martinez Brothers, talking up a cell phone while cueing loops on a CD-J. I've seen the Blackberry ads with Diplo, so I'm aware that this is the positioning the ailing company is taking to get its Bold phone to compete with iPhones and its myriad imitators. But Diplo has landed magazine covers and runs an internationally-praised record label. I guess if we're really keeping score, he's also produced a hit for Chris Brown—with a surefire follow up in "Climax" for Usher. The younger Martinez is only just 21. This isn't a knock. It's more just to illustrate my surprise that Blackberry would be so Bold—see what I did there?—as to pick such an underground dance act to represent their product. I actually thought it was pretty cool. I interviewed Steve Martinez back in January of '10, when Spy Bar here in Chicago mustered the courage to book the two, even though they'd be letting Chris in as a then under-age 19-year-old. It was around this time that they really started getting talked up outside their native New York, where they'd been taken under the tutelage of Objektivity's Dennis Ferrer and sent out on to the scene when Chris was barely 15. Now they tour the world and land Blackberry spots. Good on these two. 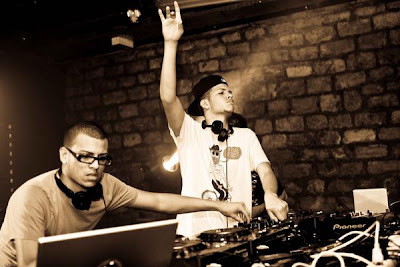 Couldn't happen to a pair of nicer, more ready-to-party youths who stand poised to carry house music's legacy on to a generation that's more familiar with Skrillex's head-banging bass barrages than the mastery of legends like Kenny Dope. And for all the haters that don't like that they use CD-Js, a laptop or show up on Blackberry commercials in the first place, I'd like you to keep that in mind. This pair is helping champion music you love. Will it help sell Blackberrys? Who knows. I respect the move on the company's part, but I feel like kids are smarter than that these days. Associating with cool is important, but only after the phone does what you want it to do. Can a Blackberry compete with an iPhone or an Android in an app-led future? I'd rather put my money on the Martinez Brothers ensuring that house music remains relevant for another 20 years. Haha I saw that commercial too just before. I first thought, "wow selling out?! really? ", but thought of some of the reasons, which you wrote before, and then said, "good for them"... Now if they chose the song for the commercial, that would have been something!